We have certainly come a long way since the days when we washed clothes by hand. Starting with the late 1990s, however, even our washing machines have become more efficient. Statistics show the typical US household does approximately 300 loads of laundry per year, which means you could have substantial savings of both water and energy if you buy a new (and more eco-friendly) washing machine. But how much water does a washing machine use and which model best suits your needs? According to Energy Star, older top-loading machines use around 40 gallons of water to wash a full load of clothes. While newer standard models use as little as 27 gallons, you will probably better of buying an efficient Energy-Star washer. These use around 14 gallons of water per wash. Moreover, appliances marked with the Energy Star logo usually consume half the electricity as standard models. Estimated figures for older washing machines reveal they use between 150 and 170 liters of water per load, while high-efficiency washing machines use 53 to 95 liters of water per load. Exact figures of how much water each type of washing machine uses vary. This is mainly caused by the fact that washing machines come in different sizes and capacities. Therefore, water factor (WF) ratings are important in comparing these machines. A water factor rating represents the amount of water used by a washing machine to wash a cubic foot of laundry. An older model’s WF is around 10 or higher and consumes 45.4 cubic meters (or 12,000 gallons) of water each year. On the other hand, a high-efficiency machine has a WF of 8; which means that if you upgrade to a HE washing machine, you will reduce your household’s water use by up to 22.7 cubic meters (or 6,000 gallons) per year. For years, the standard American home used a top-loading washer for their clothes, paired with an agitator to push or pull clothes through a full tub of water. Even though today’s top-loaders did not change much in appearance, they surely don’t waste water by filling the tub. Instead, they flip or spin clothes through a stream of water. Unlike the older models, which rinsed clothes by soaking them in a full tub, most of today’s washers rinse clothes by repeatedly spraying them with high-pressure water. Water used: Conventional top-loading washers with center post agitators use about 40 gallons of water per load. Keep in mind, however, that the 40 gallons will also require twice the energy to heat, which is one of the highest costs when it comes to washing machines. Also known as horizontal axis washing machines, front-loaders are starting to become increasingly popular for residential use. Much like a dryer, they tumble clothes in and out of a small pool of water at the bottom of the horizontally oriented stainless steel drum. This type of washing is gentler on clothes than a traditional machine. The technology used to be mainly used for commercial washers. As a category, these washing machines are better at cleaning your clothes than HE top-loaders. They also use less water and cut their dryer time due to the high spin speed which extracts more water. Most front-loaders can wash about 17 to 28-pound loads. Water used: Most front-loaders score excellent in water efficiency; they use about 13 gallons of water or less to wash an 8-pound load. Some of your best options include the top-rated Samsung WF56H9110CW and the LG WM8500HVA, each $1,450. Each washer used as little as 10 gallons to wash an 8-pound load. One of the best advantages of high-efficiency top-loaders is that they can hold more laundry (17 to 28 pounds) than agitator top-loaders. They will also wash your clothes better and use a lot less water. Thanks to their higher spin speed which extracts more water, the dryer time is drastically reduced. However, the way you load the washer is also important, because the machine may keep adding rinsing cycles until the problem is resolved. Simply add a few items at a time, instead of dumping in a basket of laundry. Also, make a habit out of washing similar items together; sheets with sheets and towels with towels. Water used: Most HE top-loaders have a very good rating when it comes to water efficiency; on average, they use about 13.5 to 17.5 gallons to wash an 8-pound load. The top-scoring Samsung WA48H7400AP ($900) uses around 12 gallons of water. On the other end of the spectrum, the Frigidaire Affinity FAHE1011MW ($550) has a very poor score, using about 26 gallons. Still among the bestsellers, top-loaders with agitators have the edge over other models because they are the cheapest. As a category, their performance is less than impressive, mostly because they waste so much water. Most models score fair or poor in water efficiency and their dryer times are also longer. Top-loaders with agitators can handle about 12 to 16 pounds of laundry, but they are impressive in terms of cleaning. Water used: One of the top-rated top-loaders with agitators, Whirlpool WTW4850BW ($580), has an excellent score in water efficiency. It uses about 13 gallons to wash an 8-pound load and provides more than good results in cleaning. There are also poorly rated washers which feature poor water efficiency, such as the Amana NTW4651BQ. It used about 27 gallons of water. Always do full loads to reduce the water waste; also, use cold water when possible. Use HE detergents for HE top-loaders and front-loaders. 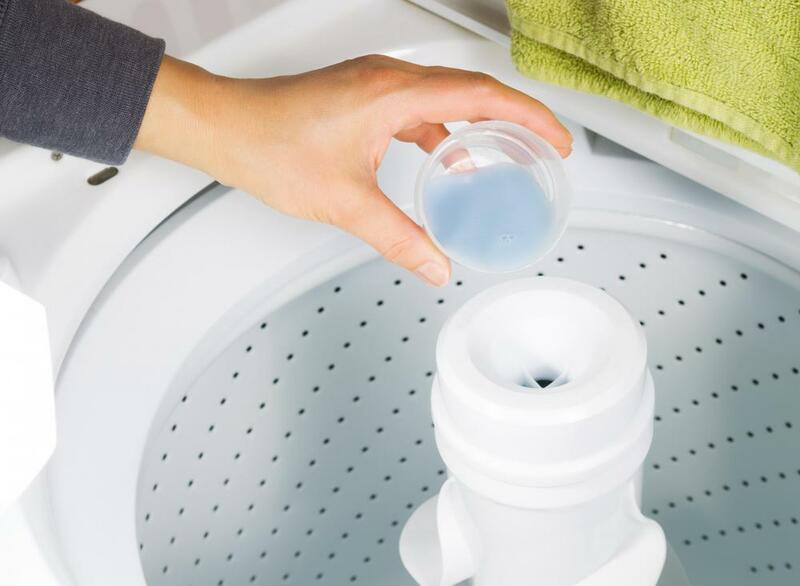 Regular detergents create too much suds; using too much can extend the rinse cycle of these washers, causing them to use more water. Choose the right soil setting for the load. The heavy-duty soil setting clearly uses more water, also extending the wash time. The normal setting should work just fine for regular loads. Pick the right water level setting—small, medium, large—for the load (if these settings are available on your machine). Most HE top-loaders and front-loaders have auto-load sensing, allowing the machine to determine automatically the load size and the amount of water required.